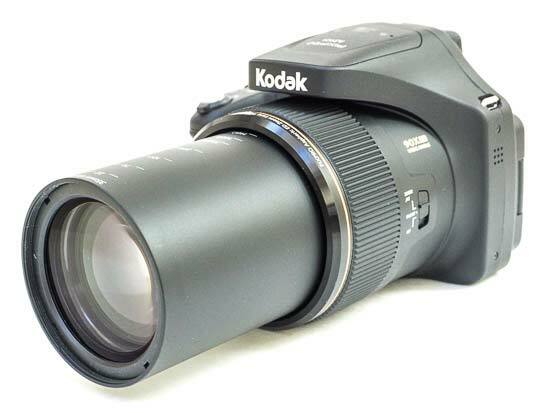 The Kodak PixPro AZ901 is a new superzoom compact camera with an incredible 90x optical zoom lens, offering an effective focal range of 22-1980mm. The AZ901 also features a 20 megapixel CMOS sensor, Optical Image Stabilisation (OIS), 5 frames-per-second burst shooting, 3.0” articulating LCD screen, VGA dioptre adjust EVF, support for JPEG and RAW file formats, 1080p Full-HD video capture, Wi-Fi connectivity and wireless control with your iOS/Android device. The Kodak PixPro AZ901 is available now for around £400 / $450. 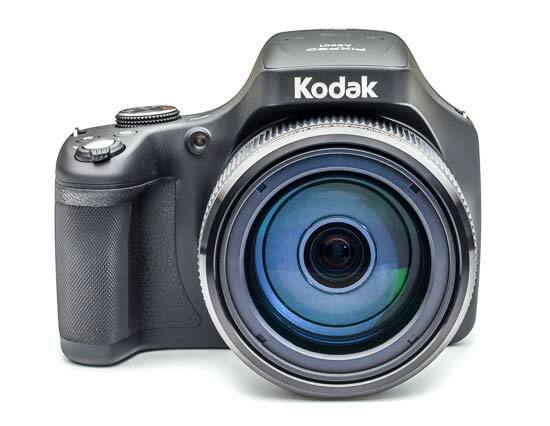 New from Kodak licence holder JK Imaging – although originally announced over a year ago – is the PixPro AZ901, a 20-megapixel DSLR-styled bridge camera that arrives with the chief selling point of a whopping 90x optical zoom. 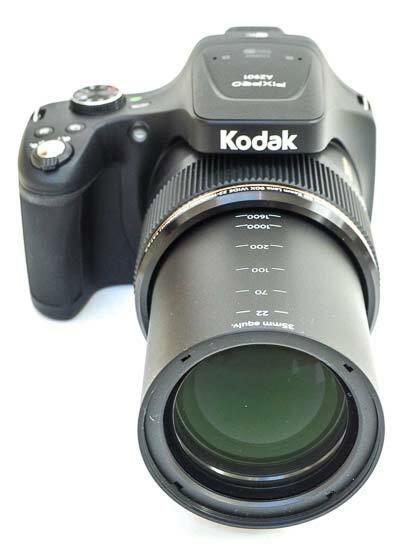 It comes with a launch price tag of £449.99 at the time of writing, which puts the Kodak branded model into close competition with the likes of Nikon’s 83x optical zoom CoolPix P900 for a similar price and/or Canon’s PowerShot SX540 HS, the latter offering a more modest but arguably more manageable 50x zoom. 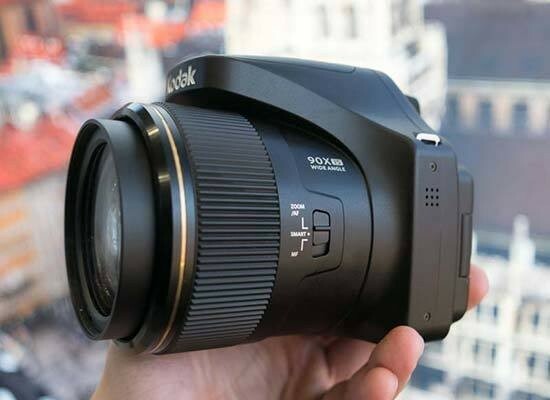 Higher priced alternatives for those in the market for a photo enthusiast-targeted all-in-ones also include the Panasonic DMC-FZ2000, a higher-end bridge camera with a higher-end price tag – yet relatively modest 20x optical reach by comparison - plus Sony’s well-received RX10 IV, a 25x optical zoom behemoth of a camera at almost twice the price again of the Panasonic. The Kodak’s necessarily optically image-stabilised lens starts out at an ultra wide 22mm equivalent setting in 35mm film terms, and stretches up to 1980mm equivalent at the telephoto end of the zoom, with available apertures ranging from f/3.1 to f/6.8. Nikon’s P900 matches this quite closely, starting out at a respectably wide equivalent of 24mm and stretching to 2000mm. Both cameras have a 3-inch tilting LCD screen at the rear. When it comes to capturing and reviewing stills and video, the Kodak also offers an eye level electronic viewfinder, though we missed the fact that there isn’t an eye sensor ranged alongside it. As it is, if you want to swap between LCD and eye-level finder you have to press the dedicated button next to it, which, for us, interrupted what could have otherwise been a seamless compositional ‘flow’. 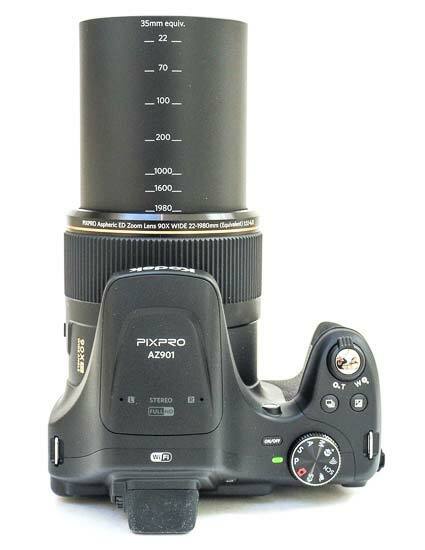 From the front, first appearances are nevertheless reassuring when it comes to the PixPro AZ901. It features a familiar DSLR type styling reminiscent of every bridge camera going, a pop up flash hidden atop the huge lens barrel, at the very back of which we find its aforementioned eye-level viewfinder. The lens barrel features a dual-use, ridged lens ring with a thumbnail-operated switch at its side. Said switch allows for the lens ring’s use to be swapped between either manual focus ring, or zoom ring with auto focus, as the user desires. A ‘smart’ middle setting for this switch is interesting, allowing, for example, the adjustment of exposure compensation in Program mode with a twist left or right of the lens ring; the adjustment of shutter speed if in shutter priority mode; or the selection of aperture f-stop settings in aperture priority or manual modes, once said modes have, in turn, been selected via the camera’s familiar top plate shooting mode dial. To the left of the huge zoom lens (if examining the camera from the front) is a tiny AF assist/self timer lamp, tucked in between lens barrel and camera grip, the latter of which affords enough space for three fingers to curl around comfortably, while your thumb rests at the back and forefinger hovers over the shutter release button. We found the shutter button release a little too obviously plastic in feel and construction, however, plus the zoom lever that surrounds it also a tad loose feeling for our liking. The zoom mechanism is also quite noisy in use, sound-tracked by a low gnat-like buzz, and it is also a little lethargic in terms of responsiveness; the lens taking 4 to 5 seconds to travel from extreme wide angle setting to maximum telephoto. It may be that this camera offers a whopper of a focal length for the investment, but that investment is still just £50 shy of £500, which isn’t inconsiderable. Like many competitors, equivalent focal lengths are however marked in stages on the lens barrel itself, which is a neat touch – such settings therefore only reveal themselves when the lens is being extended. And on a more positive note still, the camera otherwise feels solid and well built in the hand. It’s too big for even a roomy jacket pocket however, so a rucksack or shoulder bag is recommended for transportation. We do however get a shoulder strap and click on lens cover in the bag. Positioned at the rear of the Kodak AZ901’s pop up flash are pin-prick sized holes for the built-in stereo microphone; sound quality isn’t bad at all for video (with up to Full HD clips offered here), delivering a nice clear sound. Also on the top plate is an indication that the camera features built-in Wi-Fi, while a small lozenge shaped on/off power button sits adjacent to the raised bottle top style shooting mode wheel. The latter boasts a roughened edge to aid grip and stop fingers slipping when rotating it in the heat of the photographic action, while the power control is recessed into the body to avoid accidental activation/deactivation. That said, we did find the camera randomly powered down on occasion, after only having been in operation for a few seconds, which was frustrating. The shooting mode dial features familiar icons for familiar settings – so anyone who has used a compact point and shoot in the past, before smartphones destroyed that market, shouldn’t be daunted by the 10 strong selection here, which of course include a fully auto point-on-shoot option anyway. The others include the familiar Program, Aperture Priority, Shutter priority and Manual settings, alongside Custom Settings mode, a Portrait/ ‘Face beautifier’ mode, Wi-Fi mode, user-selectable subject-optimised Scene mode and Movie mode. Just forward of the dial, moving towards the front edge of the hand grip are positioned two identically sized recessed buttons for swapping drive mode between single shot and continuous capture, or adjusting exposure control and ISO. The latter isn’t obvious until you start experimenting with the camera, whereby a press of this button highlights the +/- 3EV exposure compensation, settings incrementally adjusted via a subtle spin of the rotational wheel/four-way controller at the camera back, with a subsequent right hand press hopping the selection over to ISO settings, which are in turn adjustment via this scroll wheel. It isn’t obviously, as I say, and a dedicated ISO button (rather than a dual use one) would have been more preferable, speaking personally. The light sensitivity settings on the Kodak are a tad limited for an enthusiast camera, with the max manual selectable setting being ISO3200. When you see the noise intruding into images at ISO1600 or ISO3200 and the drain of colour information, however, you start to understand why. Ultimately of course, we’re dealing with a relatively modest 1/2.3-inch sensor at the heart of this camera, even if its light gathering qualities are (on paper, at least) slightly enhanced by it being backside illuminated. So, despite a hand held night photography option to be found amongst this Kodak’s scene-optimised settings, that takes a burst of images and composites them together in an attempt to avoid visible camera shake and resultant blur, this isn’t really one for low light work. This fact is perhaps communicated by the fact that the flash will automatically pop up very often in daylight settings, where you might imagine there was already sufficient available light to help achieve a sharp shot. Luckily the flash settings include the option to disable its use, along with the standard forced flash and forced flash with red eye reduction options. At the topper-most, forward edge of the camera’s handgrip, as expected, we find a toggle switch for the zoom, ergonomically encircling the shutter release button. The lever’s forward lip falls comfortably under the pad of the forefinger, such that you can ‘feel’ your way to your preferred focal length while your eye is otherwise glued to the electronic viewfinder, the quality of which is perfectly respectable in terms of provided detail and colour. As noted earlier, it’s just a shame that an eye sensor isn’t included when switching between use of the rear plate 3-inch LCD and the smaller eye level finder – for example something you might want to do quickly when shooting in bright sunshine. 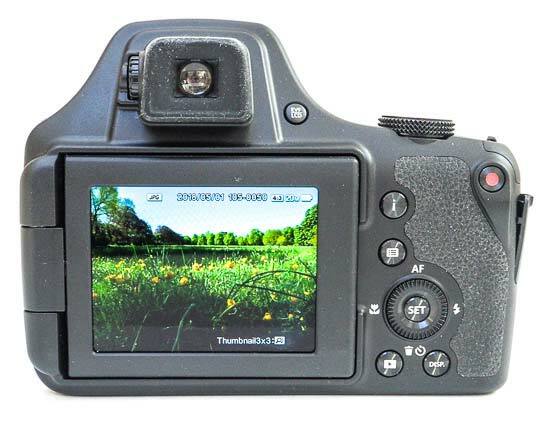 The backplate of this camera is, expectedly, dominated by the LCD screen, which, while it is not a touch screen, is at least articulated to provide a degree of flexibility and features a standard 920K-dot resolution, which is sufficient for purpose. The adjustability ensures that the monitor can be turned to face screen-inwards to the body for added protection when transporting, as well as flung out parallel to the body and twisted so the screen faces the subject for possible selfies. Undoubtedly the LCD’s flexibility also aids high or low angle shooting, and the added degree of choice when it comes to framing is to be welcomed, which is why it has fast become a feature we now expect to find on our digital cameras. Also found on this camera, as expected, is the ability to shoot Raw files instead of, or in tandem with, standard JPEGs. Shooting both together however sometimes results in an on-screen message that the image is still being saved as you attempt to quickly review it, suggesting the camera would have benefitted from a faster processor. It certainly can’t compare to a DSLR on that score. The other buttons on the Kodak’s backplate include a familiar red video record button conveniently located top right, where it falls under the thumb, and is again partly recessed to avoid accidental activation. It’s responsive in use. We also get a dedicated function/menu button that brings up two rows of shooting mode icons left and right of screen; these include options for metering, white balance, macro mode (letting us focus as close as 5cm, instead of the standard 50cm on this camera) and run-of-the-mill self-timer settings. The centre piece of the back plate, however, is the four-way control pad encircled by the aforementioned scroll wheel, arranged around which are dedicated settings for auto focus, flash, macro mode (on or off) plus a dual-use self timer (again) and delete button. The bottom buttons meanwhile are playback and display – again self-explanatory. While one flank of the camera features a built-in speaker, the other features a rubber flap, flicked open or shut with the aid of a thumbnail, protecting micro USB and HDMI ports. The base of the camera features an off-centre screw, meanwhile, next to a compartment housing both the provided lithium ion rechargeable battery and a spare slot for inserting the optional SD card (8MB of internal memory is otherwise offered – barely enough for one image). Battery life is meanwhile good for 400 shots, which is more than respectable.